Sometimes you visit a website and it just feels right. Other times you visit a website something is not right. If asked what it was about these sites that made them pleasant or unpleasant, it is often difficult to pinpoint. Well folks, this is the difference between a well designed user experience and a poorly designed user experience. User experience is critical to web design and much careful planning and consideration is given to every web design to make it a pleasant experience for the user. There are so many user experience aspects, both large and small, that we consider when designing a website. Sometimes it can be tempting to want to add in additional paragraphs, make the logo bigger and include tonnes of information, but often these ideas can actually hinder the user’s experience. Here’s five simple ways you can ensure visitors to your website are having a great experience, without them even knowing why! 1. White Space is your Friend! Our customers tend to feel that they are being cheated when they see white space. They want the best bang for their buck, don’t we all? And white space on their website looks like the unused space in their Chinese smorgasbord container. However in web design, white space is like air and content needs air to breathe. If you fill in all the space, your content is suffocated. Eyetrack III have found that white space is essential for reading comprehension, as white space makes it easier for the user to read the content and also easier to digest and understand this information. Naturally, our customers know a lot about their businesses, where it is, how people should get in contact with them and all the great things that they do. 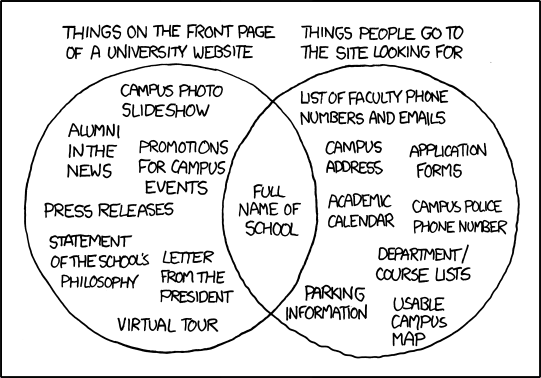 This is why it can be easy to overlook these details on your own website as inconsequential, but from a user’s perspective, these details are often precisely what they’re looking for. Don’t fall in the trap of overlooking what is important to your customers. Ensure you understand what information they are looking for and make it readily available for them. The effect of having too much choice was studied by Columbia University. Two stalls of jam were set up in a supermarket, one with 6 flavours and one with 24. The results of the experiment showed that even though the second stand looked more impressive, only 3% of customers bought jam from this stall compared with the 30% of customers who purchased jam from the first stand with 6 flavours. It can seem like a great idea to offer your customers lots of pages, buttons and products to choose from but customers are bombarded with options all day everyday. Making decisions can become tiring and overwhelming very quickly. Customers prefer to take their time to make purchasing decisions but they’re also impatient. Simplify the number of decisions for your customers to make and you will reduce the chances of them deciding to ‘finish this later’ (AKA never). Make it easy by hiding or removing unnecessary content. Headings are the most viewed part of websites and this is because they give the user cues about the content underneath. Users want to know quickly whether or not they’re in the right place and whether you have what they are looking for. Using large, concise headings at the top of your page, and also throughout your website will greatly improve the user’s experience by not wasting their time. There’s no need to be afraid of large headings! A recent trend towards larger text sizes in web design means a big win for user experience. Customers want to trust you and social proof is a great way to prove yourself and your products or services are trustworthy. Showcasing reviews and testimonials from your current customers can encourage potential customers to trust you too. There are lots of opportunities to include social proof on your website such as including testimonials throughout the site, product reviews on product pages and incorporating social media feeds and reviews. Just remember to include social proof after you have introduced yourself or your product, as this is the point where it matters most to make a positive impact. So now you know! Five simple ways to improve the user experience on your own website. Avoid making common business website mistakes by keeping your customer in mind at all times. Alternatively, let us transform your website into your customer’s dream website and generate more business, by letting us demonstrate our web design and user experience knowledge and expertise.